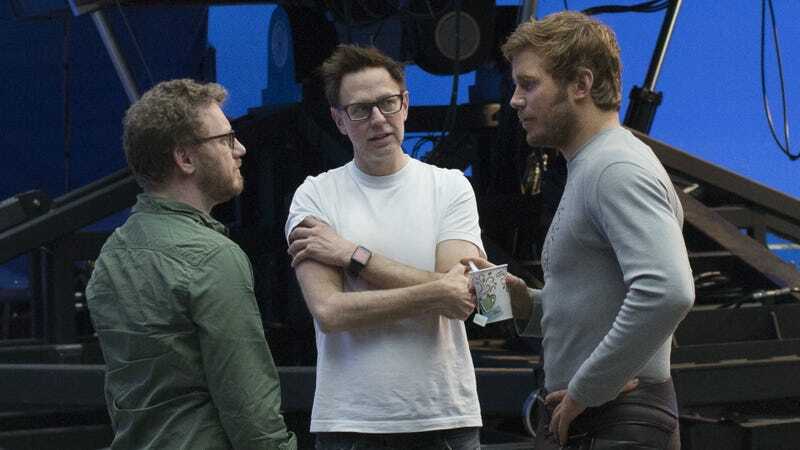 James Gunn (along with producer Jonathan Schwartz and star Chris Pratt) on the set of Guardians of the Galaxy Vol. 2. According to the Hollywood Reporter, multiple sources have said Marvel is likely to use Gunn’s script for the sequel, but will not ask him back to direct. That potential decision means his representatives and the studio are “locked in complicated negotiations” over contracts and credits—but the report suggests that ultimately, Gunn may get up to $10 million for his work on the movie since there was no breach of contract. Until that’s all settled, Gunn can’t move on to other projects, but according to the report, he’s “been approached by several top producers and executives at major studios dangling big film projects.” That’s not surprising considering his critical popularity and box office returns. And other studios seem to share the sentiments of many in Hollywood—including Gunn’s Guardians of the Galaxy cast—that while what Gunn said in his controversial tweets was wrong, the consequences don’t fit the situation and surrounding context.